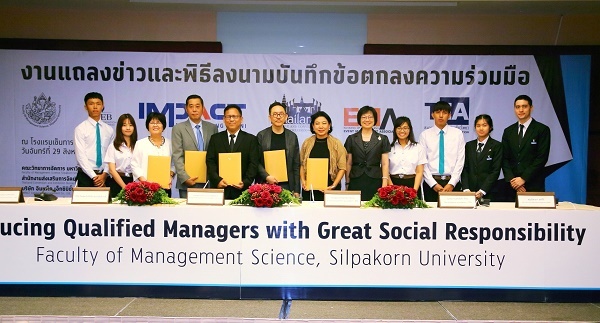 IMPACT Exhibition Management Co., Ltd., led by Mr. Loy Joon How (4th from left), General Manager, has recently signed a a Memorandum of Understanding (MOU) with Silpakorn University, led by Assoc. Prof. Dr. Phitak Siriwong (5th from left), Dean of Faculty of Management Science, Thailand Convention and Exhibition Bureau (TCEB), Thai Exhibition Association (TEA), Thailand Incentive and Convention Association (TICA) and Business of Creative and Event Management Association (EMA), to mutually promote and develop standards for Thailand’s MICE industry on a global scale. The MOU signing ceremony was held at Centara Grand Hotel at CentralWorld, Bangkok. Faculty of Management Science at Silpakorn University specialized in hospitality and hotel management offers a Bachelor’s degree in Exhibition and Event Management. The bilateral collaboration will grant exclusive privilege to Silpakorn University for student internship programs at IMPACT Exhibition and Convention Center. Students will gain hands-on experience, work side by side with assigned mentors, and partake in trainings, workshops, as well as on-site and off-site activities during the internship period.